Businesses should consider an e-commerce platform's costs, functionality, flexibility, and scalability before choosing the right one for them. E-commerce is a growing industry and requires the best resources to be successful in the market. Consequently, business owners seek the most reliable and scalable platform from a wide variety of options. To help future customers with their search, this article surveys the most reliable e-commerce platform that hit the market in 2018. First, it’s important to review the types of platforms before surveying this year’s releases. There are two main ways to classify e-commerce platforms: open source and SaaS (PaaS). Open source means that you can check and modify its code freely. Although hosting for open source could be cloud-based or on-premise, it requires manual setup either way. SaaS means that the system is located on the cloud, licensed on a subscription basis, and centrally hosted. Customers can get hosting and the platform from a vendor concurrently. Both open source and SaaS platforms have basic packages for small businesses and more meaningful solutions for enterprises. Company size is an important factor as you consider the options. Eliminating third parties is the best opportunity for growing an e-commerce business. Websites should reflect in-house preferences and give companies the freedom to control the whole process. You should only build on a platform that gives your company direct contact and access to customer information. Once you’ve built your core business, you can use different channels to promote the brand, boost traffic, and increase sales. These channels can be on social media or in affluent marketplaces but are only beneficial if the e-commerce platform works for your business model. Popular platforms include Salesforce Commerce Cloud, Oracle Commerce, Shopify, BigCommerce, SAP Hybris Commerce, Magento Open Source, Ecwid, WooCommerce, Shopify Plus, and Oracle Commerce Cloud. Some of these platforms are open source, some are SaaS solutions, and others are suitable only for big enterprises’ needs. I’m going to specify each of them to help you make clear the effectiveness of each solution for e-commerce business. What do I want to spend? The price for platforms, their packages, and web development varies. Budget these costs in advance to have an accurate price estimate. What is the size of my business? Do you have a small, midsize, or enterprise company? This article addresses all platforms for all types. Is the platform capable of extending and scaling? If you want to be able to manage your workflow and sales, the platform must accommodate your inventory size and provide extensive analytics. Moreover, your business will grow, and you might need customizations, extensions, and integrations in the future. Is it easy to manage the platform? Simplicity and flexibility are essential. Administrative panels enable customers to manage the store efficiently. There are several leading platforms on the market, but not every platform will suit non-enterprise stores. 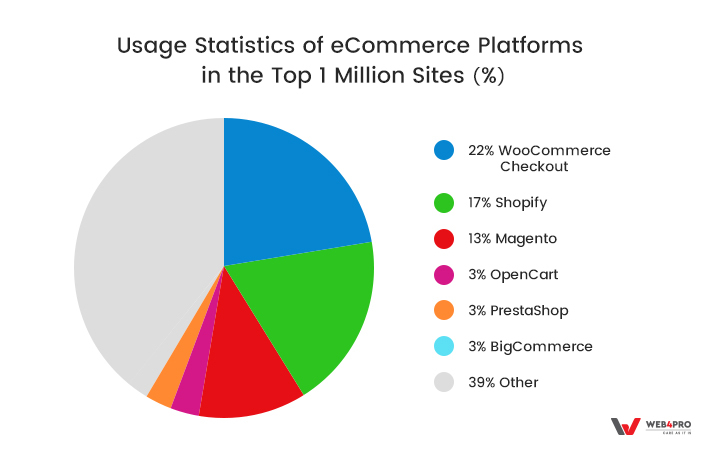 Let’s look at the five most popular platforms for small and midsize businesses: WooCommerce (WordPress plugin), Magento 2, PrestaShop, OpenCart, and Shopify. Magento 2 Open Source is a robust and scalable solution. Numerous international merchants trust the platform because it provides extended functionalities for a variety of needs. WooCommerce is lightweight and easy to use, which makes it an excellent choice for beginners and small businesses. OpenCart is lightweight and offers a free demo version on its website. PrestaShop is an open-source platform. You can also manage multiple stores, use a starter theme, or take your store to the next level with add-ons. Shopify is a SaaS solution. It comes with different packages from which you can choose for your business needs and budget. 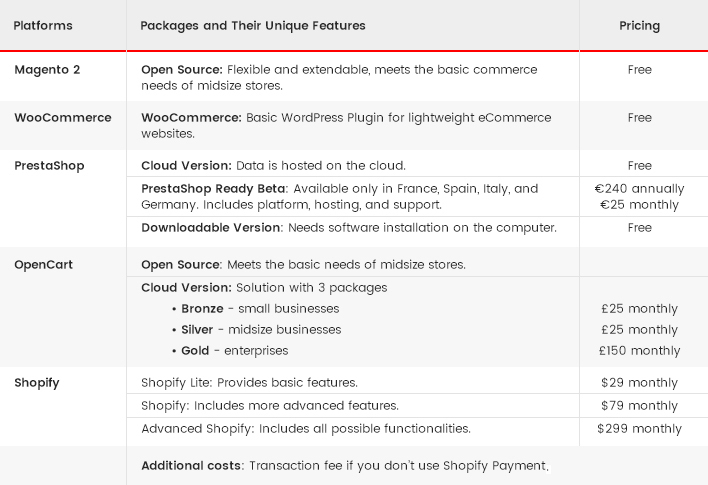 According to BuiltWith usage statistics, WooCommerce is a top leader for its simplicity while Shopify, Magento, and BigCommerce also rank high for their affordability. Shopify ranks highest in the United States; Opencart. Magento, and PrestaShop are also popular in the UK and France, respectively. To compare platforms fairly, we’ll highlight the main platform characteristics. Now, let’s move on to the features list, where you can see the main functionality and characteristics of each platform. 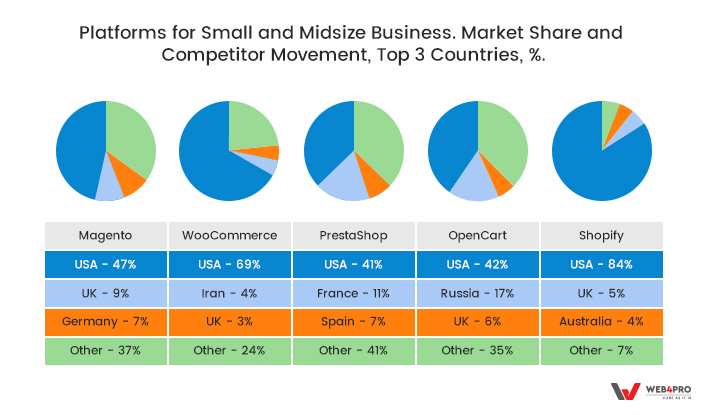 WooCommerce, Prestashop, and OpenCart are best for beginners and small-to-midsize businesses. These platforms are easy to operate and affordable. Magento 2, on the other hand, is advanced and appropriate for businesses with access to professional web developers. Shopify provides excellent management tools, but the price is comparatively higher. Moreover, it’s hardly customizable; you’ll need to decide whether the offered features satisfy your needs. SAP Hybris is a robust solution for online stores, order management, digital asset management by OpenText, and product content management. Magento 2 Commerce is an enterprise solution and has several exciting B2B features. BigCommerce is a cloud-based platform with integrations for social media and payments. 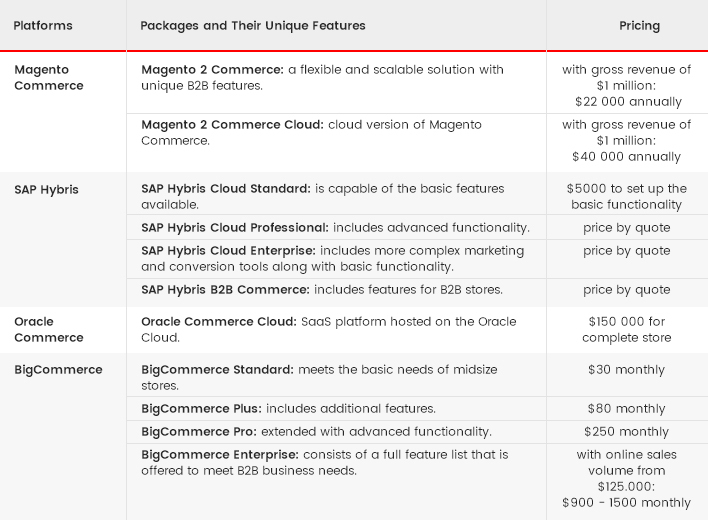 Oracle Commerce is a big but flexible platform for multichannel, multisite, multi-brand, multilingual, and multi-currency environments. 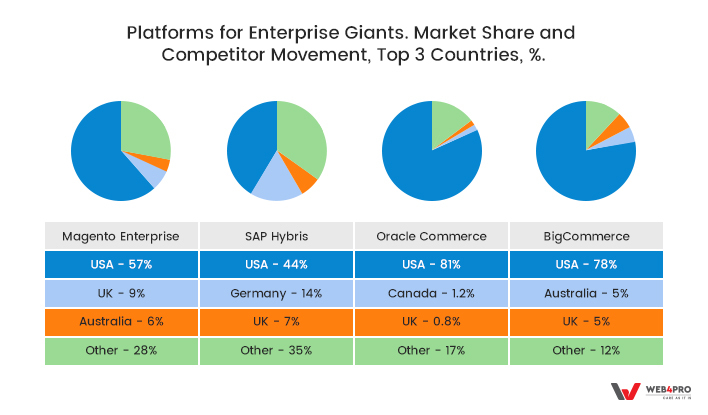 Oracle and BigCommerce have large stakes in the United States. 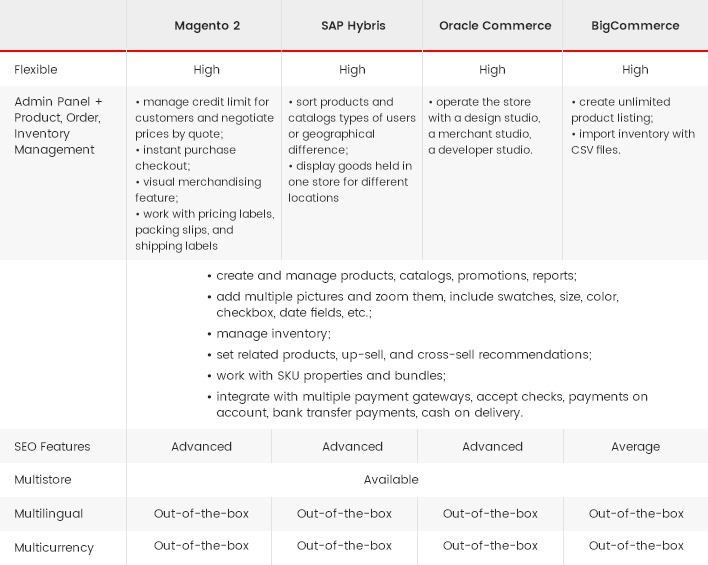 The percentages are more evenly spread for Magento Enterprise and SAP Hybris. Now it’s time to compare the enterprise solutions. Navigate using the table below. Add multiple pictures and zoom them, include swatches, size, color, checkbox, date fields, etc. Integrate with multiple payment gateways, accept checks, payments on account, bank transfer payments, cash on delivery. Big data makes most B2B solutions fully-functional, secure, and user-friendly. 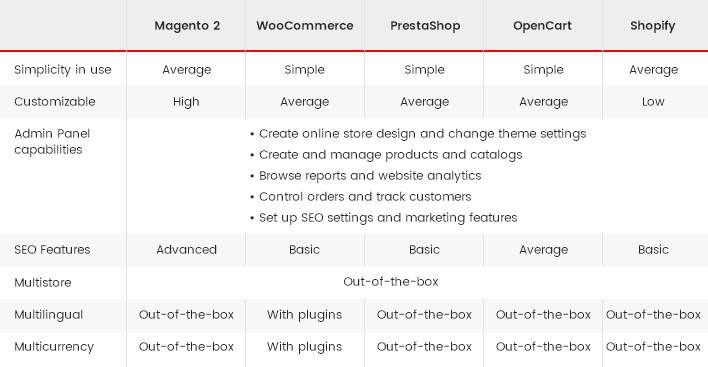 Magento’s module-based structure makes it the most scalable. However, cost is a common disadvantage. For big solutions such as Hybris and Oracle, finding the right programmer and upgrading to the next version may be difficult on a limited budget. All Businesses must now comply with the European Union’s new General Data Protection Regulation (GDPR) law. According to the new law, you need to decide which group you belong to (check the lawful basis) and how you will perform all necessary changes to your site. As for small to midsize platform solutions, Magento 2 and Shopify have the most robust security, but at the same time, they require more server resources than their competitors. WooCommerce, OpenCart, and PrestaShop require fewer resources, which make them suitable for boutique shops that only need more general security measures. Which E-Commerce Platform Will You Choose? In this article, I’ve considered five platforms for small and midsize businesses and four platforms for enterprises. I’ve highlighted the most popular solutions and the parameters to help you make an informed decision. Your decision will likely factor costs, functionality, flexibility, and scalability of the platform. Your final determination will depend on the business size, product type, and plans for future growth. Now, you have the resources to make the best decision for your company. 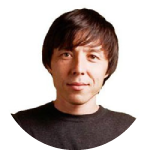 Marat Mingazov is CEO and founder of WEB4PRO, a Magento 2 development agency. Being working in the eCommerce industry for more than 15 years, he and his team focus on building trustful B2B partnerships and developing eCommerce projects for businesses. WEB4PRO helps their clients to create reliable technical solutions and highlight their brands.